Would these scripts work in cs6? Cody – I do not have CS6 and this was tested with CS5, but am pretty sure this would work on it as there were not any major changes on scripting support with CS6. I could swear that I see movement in the Creative Style Option 1 [Comet Style] + Star Spikes Pro :) This is proper awesome, thank you very much. It sure does make the shot dynamic, right Teh :) Glad u like it , thanks ! i have headache to read cause i not so good in english.. can you make a video tutorial? Hi Choz – sorry this format is not working out for you. I have not done any video tutorials yet. Will check that out and drop u a note if I have one published soon. Thanks. Will these work with a Mac? Hi Jeff – Sorry was not able to get back to you earlier. I do not have Mac and had to check this out. Am pretty sure the script will work on Photoshop running on Mac without any concerns [http://help.adobe.com/en_US/photoshop/cs/using/WSfd1234e1c4b69f30ea53e41001031ab64-7419a.html]. Do let me know how it goes for you. Thanks ! @Sathya, the update contains only HI RES photos download and not the script, could you please upload a new link? Also, I have a web server with virtually unlimited resources, I’d love to host you a mirror of the script for free. Contact me by email should you be interested. Hi Goldy – The script was a separate download. Please try http://bit.ly/137haR0. Appreciate the offer, am currently on road, will drop u a note as soon as I am back. Have a great day ! @Michael – The alternate link should work – http://bit.ly/137haR0. If ur still having challenges, drop me a note and will mail the copy of the same. Thanks. This is phenomenal! Thank you SO much. I’ve been looking for something just like this for a while, but have only found people selling similar scripts for $40+! I gave them a test run and they seem to work perfectly. Thanks again. Hi Jesse – Am really glad u liked it as much :) Would love to see the final result too ! I enjoyed your Sleeping with the Stars. I was successful in capturing some decent night images. Thanks for you tips. The stacking script worked well too. I am having issue running the effects and trails scripts though. Probably user error, but wondered. I don’t have an pen to anchor and not sure where to anchor. 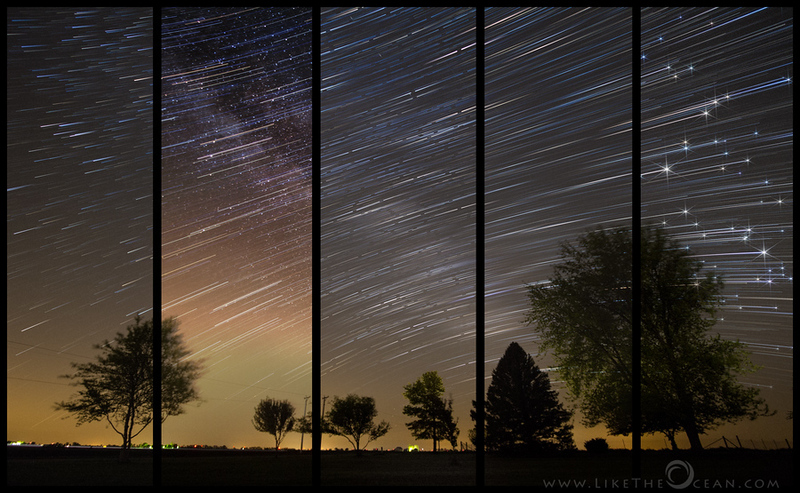 My complete image trails. In other words, the trees, pier, whatever trails, not just the stars. Do I need to add in the foreground after the fact? Not really sure. Do you have a tutorial anywhere? I think this could be a fun, creative tool if I was clear how to use it. Thanks. Hi Scott – Glad u liked it. I do not have any detailed tutorial yet. Yes the foreground needs to be masked … below is the high level work flow ! Hope it helps !!! 7. Apply any final adjustments like contrast, noise reduction etc. Thank you. Seems to work well on a fairly simple image. The one I was working on was from underneath a pier. Possibly could work, but need a little more practice. Thanks for getting back with me and sharing your knowledge. Best regards. I’ve been trying to get the creative trails script to work but fails for me, says too many layers. I have 51 images in photoshop as layers. 51 does not seem much, thats like 45min worth. I have timelapse that go into more than 3 hours, which is over 300 images easily. whats the trick to get past this error? I have iMac, mac osx 10.10.1, photoshop 2015 CC. Note: the other creative ui script runs but not the trails. Hi John – I hope ur indeed referring to the new scripts with UI (posted here @ http://wp.me/PDOr-xB. The CreativeTrailUI Script is actually for creating trails in Post Processing. Hence the error message. It takes only one layer as input and creates the trail based on the settings. If u already have 51 images – CreativeEffectsUI is the way to go. If u still want to play with CreativeTrailsUI, just take the first frame (Delete remaining layers) and run it ! Hope it helps !!! I only Have PS Elements 12 and work with Corel Paint Shop Pro; PSE doe not have script running capabilities that I am aware of. Can these scripts be used with PSE12 or COrel?